I look forward to seeing familiar faces every single Fall and Spring for the mini session series. It’s so much fun for me to watch your family grow. 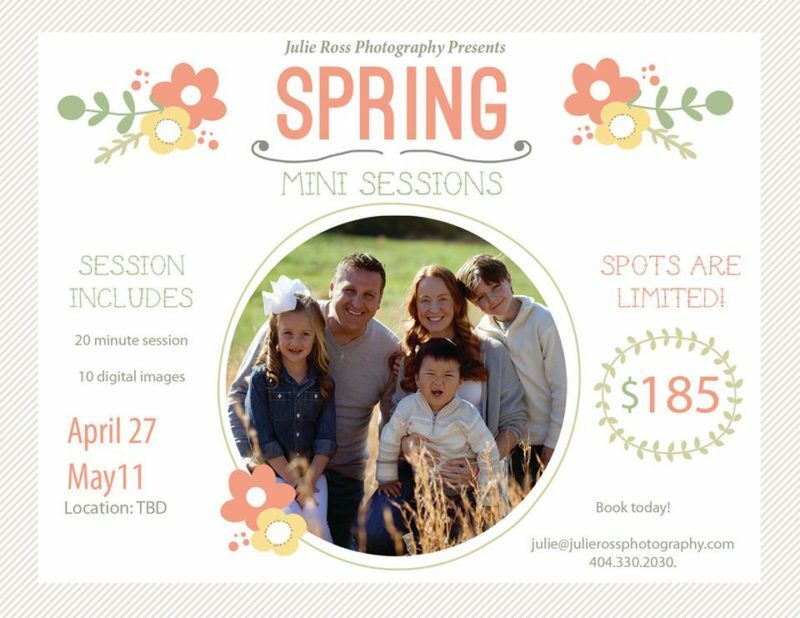 Let’s discuss minis…Mini sessions are great for families of 4 or 5, especially with younger kids. We can get in a quick, fun filled session and by the time the kids are asking how much longer until they can go play, we are finished. Minis are also great for families that do not want outfit or location changes. These sessions are short, so they go by quickly. 10 digital hi-resolution professional images (for download from secure site). If you’d like to purchase more than 10, you do have the option to choose all of the edited images from you session. Location will be chosen in late March. April 27 and May 11. Time slots are available 8-11am and 4-6:30pm in 30 min intervals. © 2019 Julie Ross Photography-Woodstock GA Newborn, Child, Family Photographer|ProPhoto Photography Blogsite | Designed by That's Kinda Cool!